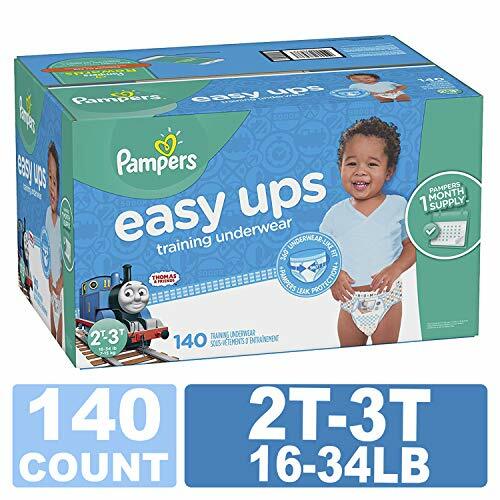 Pampers Easy Ups are an easy way to underwear! 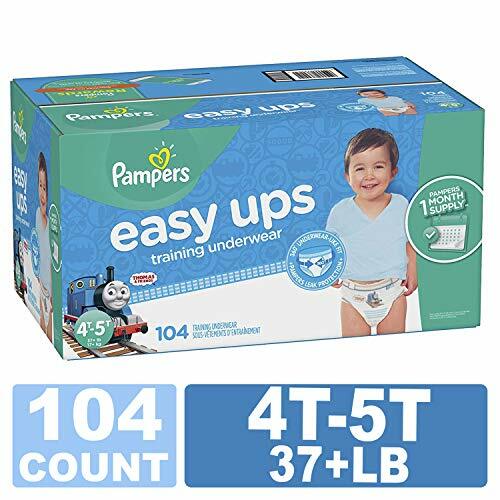 Pampers Easy Ups Training Underwear have a 360 Degree stretchy waistband that moves with your toddler, giving him a fit that's just like real underwear. The elastic waistband helps him to pull up his Easy Ups with ease, like a big boy. They also tear easily at the side seams for easy removal, just in case! Easy Ups are super soft, like cotton underwear, to keep him comfortable, while the Dual Leak Guard Barriers will keep him confident-helping prevent the leaks that can happen when he moves. Plus, Pampers Easy Ups are the only training pants with Extra Absorb Channels to give him the outstanding Pampers Leak Protection he needs during the day AND night. A collection of Thomas the Tank Engine designs will help make potty training fun! 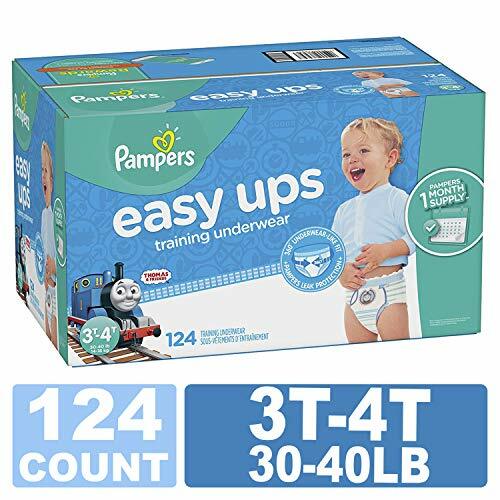 Pampers Easy Ups: he'll think it's underwear. You'll know it's Pampers. Available in sizes 2T-3T (18-34 lb. ), 3T-4T (32-40 lb.) and 4T-5T (38-50 lb. ); visit Pull-Ups.com for tips, resources, games and more! The #1 training pant brand*, Pull-Ups help make potty training easier vs. using diapers we ve helped train 50 million Big Kids and counting! 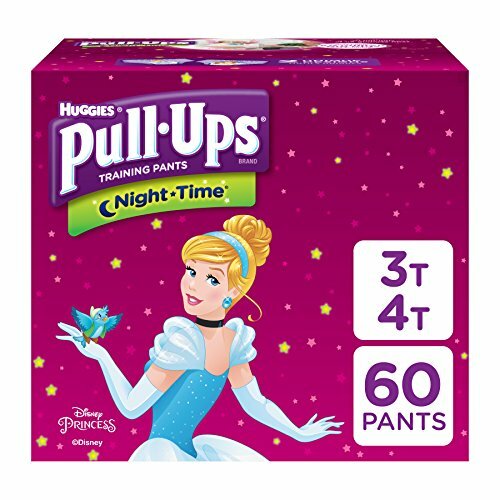 Pull-Ups Training Pants for girls give your child trusted day and night leak protection, with added absorbency where she needs it most and easy-open sides for quick changes. 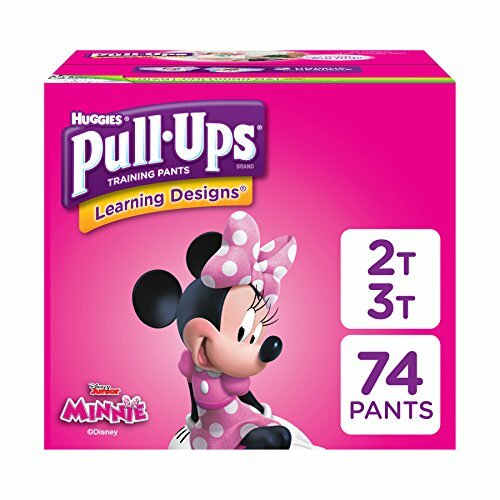 Each pack of Pull-Ups for girls includes two designs your child will love Disney s Minnie Mouse and Doc McStuffins with graphics that fade when wet to help her learn. Pull-Ups disposable training underwear provide all-around coverage with soft, stretchy sides for a great fit, and an underwear-like design that lets your child slide them on and off easily. 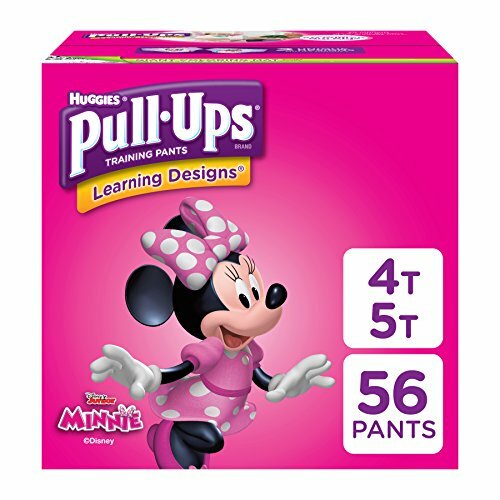 When your child is ready to begin her potty training journey, the Pull-Ups brand can help. Visit Pull-Ups.com for expert articles, tips and resources. Pull-Ups Potty Training Pants are available in sizes 2T-3T (18-34 lb. ), 3T-4T (32-40 lb.) and 4T-5T (38-50 lb.). 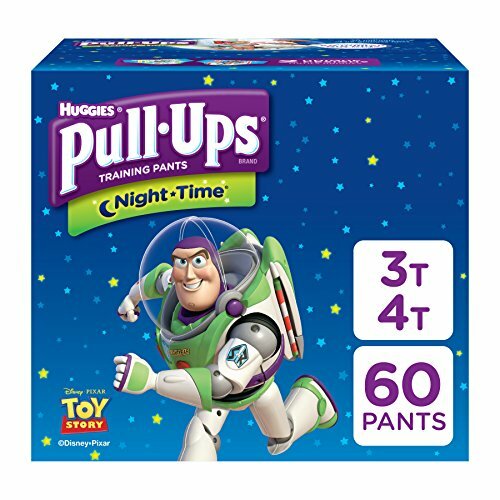 HUGGIES Pull-Ups exclusive Disney graphics with Pixar's Buzz Lightyear and Woody from Toy Story that fade when wet. Available in sizes 2T-3T (18-34 lb.) and 3T-4T (32-40 lb. ); visit Pull-Ups.com for tips, resources, games and more! 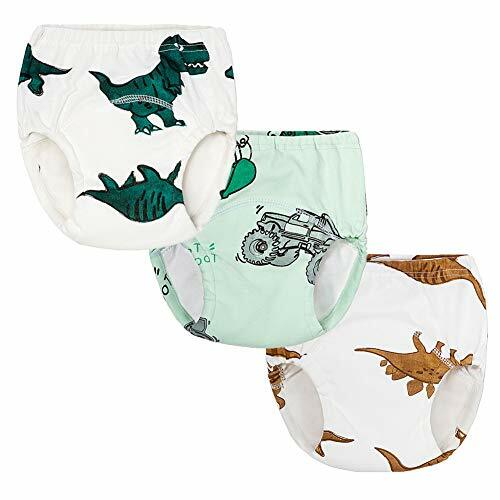 Training underwear are ideal for toddler boys and girls who want to feel like they're wearing 'big girl' or "big boy"pants while potty training and used when accidents are less frequent. MooMoo Baby Training Pants have been extra padded in the front and back. It's water resistant and better water imbibition than normal undies, committing to give baby the most comfortable experience and achieve effectiveness, easily to use and perfect choice for moms and toddlers! 5 Layers-- Extra padding in the front and back,water resistant and better water imbibition than normal underwear. 100% Cotton---Soft and breathable material ,more comfortable and healthy! Durable, washable and reusable for multiple uses. Lovable friends 4 pack training pants are the right tool for transitioning from diapers to potty. These training pants have a cotton outer layer with an absorbent polyester inner layer. These pants are made to feel like real underwear to make your little one confident. Size 18 months fits weight range of 25.5-29 lbs. Size 2t fits weight range of 29-31 lbs. Size 3t fits weight range of 31-34 lbs, size 4t fits weight range of 34-38 lbs. Material:100% cotton outer layer + 6 layers inside + 100% hold at least 30ml of urine if the waist and thigh band fit snug.Very durable soft cotton material that is sewn with precision. Packaged with 4 pack training underwear. Cute prints look great on boys and girls. Tag runs larger, please ignore it. The 6 layers makes the pants more absorbent than regular underwear, helping to catch small accidents (won't hold a full bladder like a diaper, not recommended for night time). Training pants are designed to feel like comfortable underwear and are tested to hold at least 30ml of urine if the waist and thigh band fit snug.Your child will feel the wetness with the onset of an accident, where they can be taught to notify you or head to the potty. Machine-wash, Dryer-Safe, Washable, Durable and reusable for multiple uses.100% no hassle money-back guaranty if you don't like them. 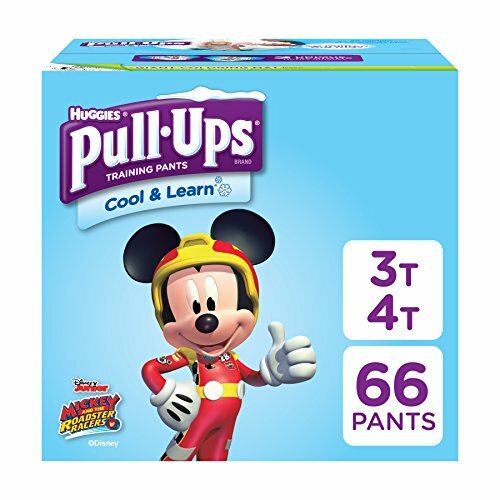 The #1 training pant brand*, Pull-Ups help make potty training easier vs. using diapers we ve helped train 50 million Big Kids and counting! Pull-Ups Training Pants for boys give your child trusted day and night leak protection, with added absorbency where he needs it most and easy-open sides for quick changes. 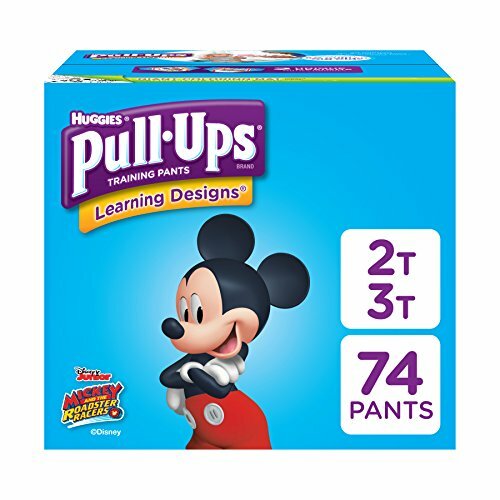 Each pack of Pull-Ups for boys includes two designs your child will love Disney s Lightning McQueen and Mickey Mouse with graphics that fade when wet to help him learn. Pull-Ups disposable training diapers provide all-around coverage with soft, stretchy sides for a great fit, and an underwear-like design that lets your child slide them on and off easily. 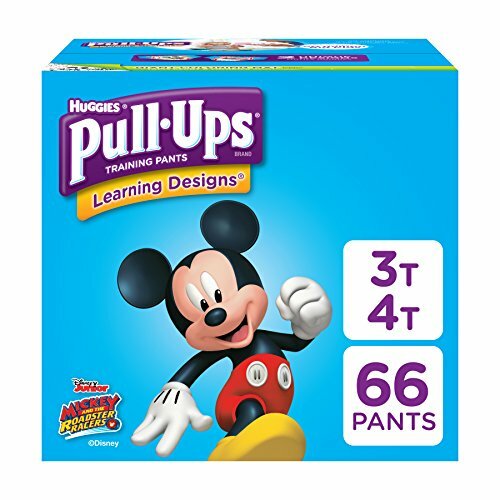 When your child is ready to begin his potty training journey, the Pull-Ups brand can help. Visit Pull-Ups.com for expert articles, tips and resources. 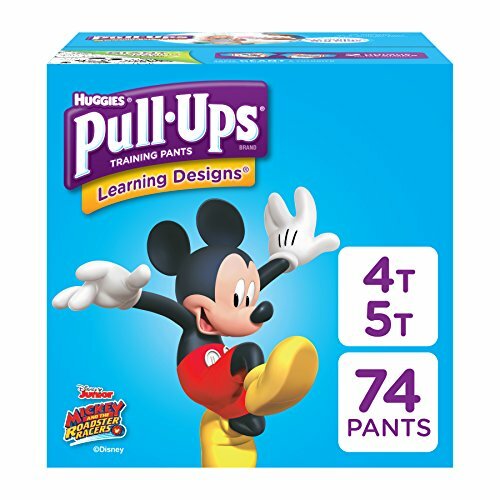 Pull-Ups Potty Training Pants are available in sizes 2T-3T (18-34 lb. ), 3T-4T (32-40 lb.) and 4T-5T (38-50 lb.). This Potty Training Pant is a little big, If your baby is thin, please choose one size small. 100% Cotton, 6 Layer waterproof interlining, very durable soft cotton material that is sewn with precision. 1. Gentle elastic at waist for a comfortable fit and make kids easy to pull up and down by themselves, designed to help kids learn to use potty. 2. 6 Layers of cotton rib interlining to help contain small accidents allows toddlers to feel wetness while minimizing accidents. 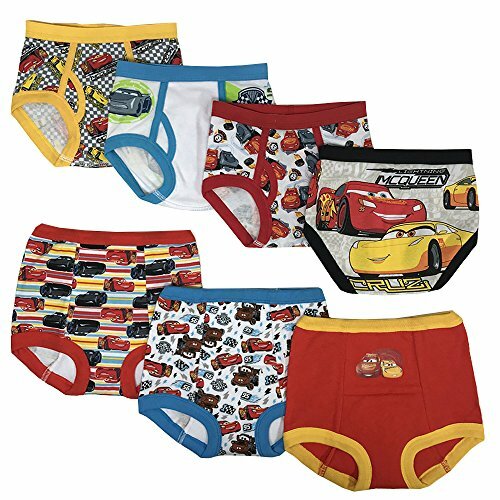 Encourages Toddlers to Transition from Diapers to Underwear! 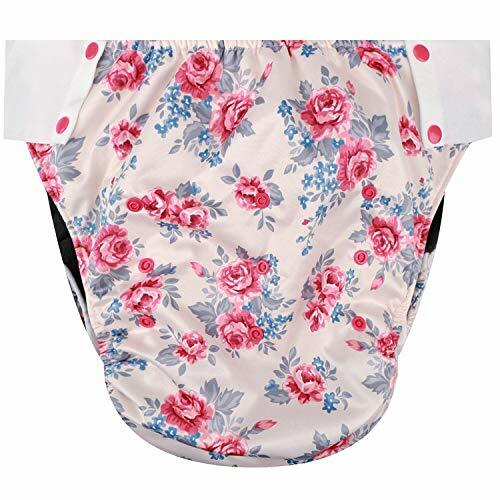 Size suitable for toddler 12 Months, 2 Years, 3 Years, This Potty Training Pant is a little big, If your baby is thin, please choose one size small. Training Pants are made of soft 100% combed cotton, inner with cotton rib padding for more breathable and extra absorbent. Great transition pants to underwear, child easily pull up and down. 6 layer Inner padded to absorb small accidents and avoid leakage, washable and softer. Medium Size (Fits *most kids weighing 35-50lbs) has a max waist of 20in. and a relaxed rise of 8.5in. Total relaxed length of the diaper is 13.5in. Relaxed width in crotch area is 6in. Relaxed leg opening is 11.5in. 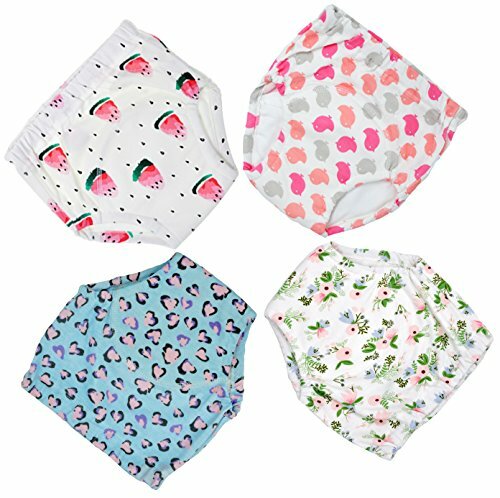 HappyEndings Eco Diapers is a mama-run US company, offering budget-friendly cloth diapering options for babies, kids, and adults since 2013. 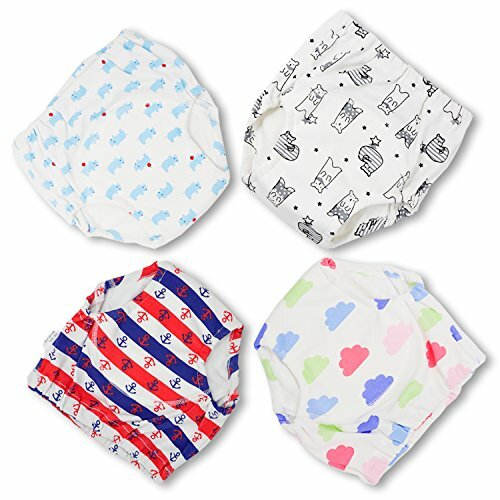 Our diapers are CPSIA compliant and we proudly offer licensed prints. FEATURES: MULTI-FUNCTIONAL: This diaper was designed with big kids in mind who are incontinent or on a delayed potty training schedule. Use as a diaper or as training pants. BIG KID SIZE: Fits kids from 65-100lbs. Trim design with snap buttons to adjust rise and waist for growth and a great fit every time. EASY FOR PARENTS & KIDS: Side snaps make it easy for parents to remove the soiled diaper. Wide and soft elastic in front and back is perfect for potty training your child for easy pull on and off action, just like real underwear. Sides are completely removable -we know elastic wears out over time. Just contact us and we will replace them! CUSTOMIZE ABSORBENCY: The contoured, 5 layer snap-in stain resistant micro fleece insert offers highly absorbent leak protection. Add additional inserts to the pocket to customize absorbency for heavy wetters, night, or travel. COMFORTABLE: PUL outer layer is breathable and water resistant, no diaper cover needed; Soft stay-dry micro fleece lays next to your child's skin, keeping them dry and comfortable. ECO-FRIENDLY/EFFICIENT: Easy on/off design, ultra-fast drying when shell is hung on the line. Designed to be quickly reused. *Disclaimer: Fit will vary on some children. Check your child's measurements to insure you've selected the best size for them. MULTI-FUNCTIONAL: This diaper was designed with big kids in mind who are potty training, incontinent, special needs, or on a delayed potty training schedule. Use as a diaper or training pants. Medium Size (Fits *most kids weighing 35-50lbs) has a max waist of 20in. and a relaxed rise of 8.5in. Total relaxed length of the diaper is 13.5in. Relaxed width in crotch area is 6in. Relaxed leg opening is 11.5in. Snap buttons to adjust rise and waist for a good fit as your child grows. EASY FOR PARENTS & KIDS: Side snaps make it easy for parents to remove the soiled diaper. Wide and soft elastic in front and back is perfect for potty training your child for easy pull on and off action, just like real underwear. Sides are completely removable -we know elastic wears out over time. Just contact us and we will replace them! CUSTOMIZE ABSORBENCY: The contoured, 5 layer snap-in micro fleece insert offers highly absorbent leak protection. Add additional inserts (not included) to the pocket to customize absorbency for heavy wetters, night, or travel. COMFORTABLE/ECO-FRIENDLY/EFFICIENT: PUL outer layer is breathable and water resistant, no diaper cover needed; Soft stay-dry stain resistant micro fleece lays next to your child's skin, keeping them dry and comfortable. Eco-Friendly/Efficient: Easy on/off design, ultra-fast drying when shell is hung on the line. Designed to be quickly reused. Daddy's Choice Training Pants are an easy way to underwear! Daddy's Choice Training Underwear have a 360 Degree stretchy waistband that moves with your toddler, giving baby a fit that's just like real underwear. The elastic waistband helps baby to pull up their diaper pants with ease, like a big baby. Training Pants are super soft, like cotton underwear, to keep baby comfortable, while the Dual Leak Guard Barriers will keep baby confident-helping prevent the leaks that can happen when baby moves. Plus, Wetness indicator shows when it's time for a change. 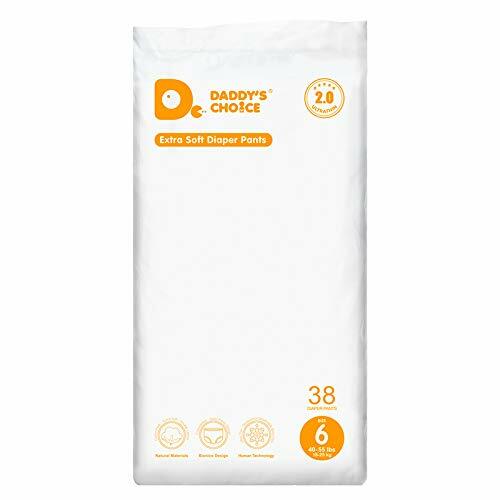 Daddy's Choice diaper pants are a knid of training pants with Extra Absorb Channels to give baby the outstanding Leak Protection baby needs during the day AND night. 360 Stretchy Waistband for an underwear like fit that's easy for your toddler to pull up and down. 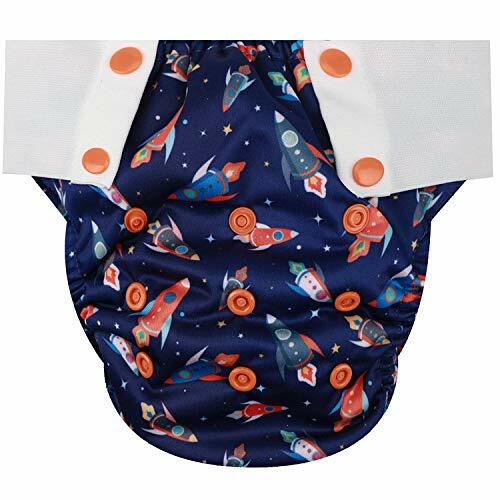 Classic, Eco-friendly and Fragrance Free diaper design minimizes the risks of allergy and diaper rash. Leakage protection for up to 12 hours.Wetness indicator shows when it's time for a change. Ultra-absorbent and perfect for both Daytime and Overnight use. Money-back guarantee if you're not completely satisfied. Nice and soft training pants designed to catch little accidents while potty training. 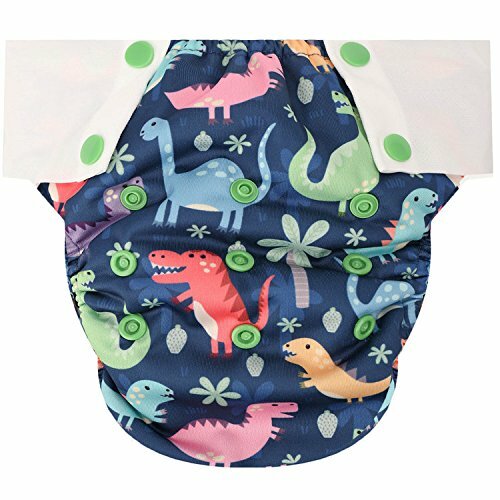 This potty training pants come in a variety of sizes and will fit babies, toddlers and kids up to age 6. The training pants will let your little one feel wetness during an accident, while minimizing the need for clothing changes. Help your child potty train more effectively. Made of 100%Cotton. Soft, comfy and friendly to toddlers' sensitive skin. Suitable for little boys girls age: 1-2years, 2-3years, 3-4years, 4-5years, 5-6years. 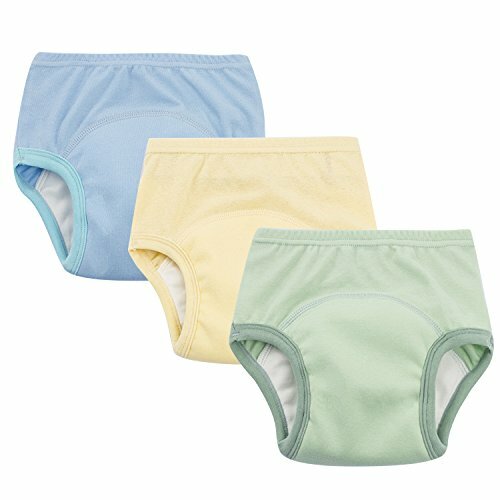 Potty training pants padded with 6-layer microfiber liner, makes the pants partially waterproof, help to catch small accidents, ideal to use at night times for extra protection or for long car travels. These training underwear has gentle elastic on the legs and waist, young children can pull them up and down just like real pants. Machine washable, Tumble dry low, Do not iron.